Tsw: Spring Update Available Now! Discussion in 'Dovetail Live Article Discussion' started by TrainSim-James, May 3, 2018. · Fixed an issue where the GP38-2 Auto Brake was not sitting in the ‘suppression’ notch"
Wow that's everything you fixed on heavy haul? Still no fix for tunnel darkness and all the other bugs? And then posting a pic off an AC4400 for the spring update that i guess still has the buggy brakes? It’s progress so credit where it’s due. I’m happy with that...keep it coming!! hightower: allmost no fix for HH since half a year is progress for you? Nice!! Hope someone could report some of his experiences regarding the performance improvements back since Im currently not able to test it myself. Huge difference or rather small? It’s a fair point but it’s probably the DLC I play least to be honest so I’m not particularly that bothered. I totally get why it would bother you though! Seeing this update list means this may be an opportunity to see some better improvements to the core in the next add-on and afterward. Still, I don't blame them for not updating Heavy Haul as much as expected lately (They did say it was resource intensive). Let's just hope they really fixed the Safety System on the NEC this time. As well as other improvements and add-ons to the Xbox version in the near future. hightower: its still my favorite route, sadly DTG seems to have forgoten it completly. Still no ATP for the HST? even though it apparently "just missed the release of GWE" back in September last year. First drive and first new bugs found with this new patch... dont you guys test drive your updates? So instead of fixing heavy haul with tunnel darkness you remove the tunnel darkness in NEC? There is a huge part where the tunnel darkness is now missing. I completely forgot about ATP and the statements on it. Very interesting that we have ACSES now, which is really just a different way of doing exactly what ATP does. Surely it can’t be that outrageous to finish ATP now? It’s actually better because these tunnels are lit up in real life. DTG: locos and wagons in the waverly yard are still missing too. I see it now. They should bake the lighting in there like in Penn Station. Not sure if this bug is from the update of whether it is pure coincidence but my 166 randomly applied the brakes with no AWS/DSD warning and I am unable to release them. Shortly after leaving Paddington, just short of Acton Mainline. I’ve been out but got a very quick go on a 166 service out of Reading to Paddington before I left. Exact same thing, no warnings of any type and it slams the brakes on about 2 minutes out of Reading. I thought it might just be the one service...please tell me this update hasn’t broken GWE. Pretty please. ps I couldn’t release them either. I did a service in the Class 166 between Paddington and Old Oak, no issues whatsoever. Good to hear. Worth reporting as a bug though I think, I’ll try tomorrow and see if it happens again. No issues with the 166 for me, however still pretty lifeless.....train still sits in paddington for 20mins with doors closed as people gather around trains lol little basic realism tips....please look into it? 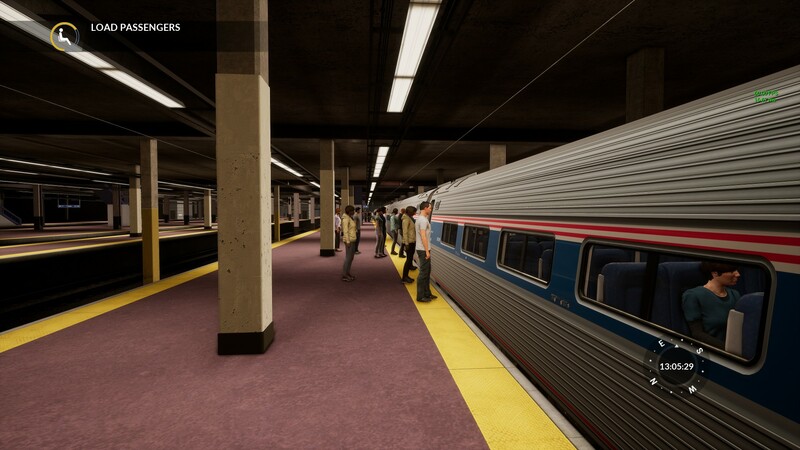 If train doors are open.....ai passengers should be boarding it, apart from that havnt seen major changes but is smoother loading through the route good to see updates! It seems to happen at random events and on random scenarios for me. I have just come to a halt outside Reading heading toward Paddington for no reason, with the brakes having been applied. No AWS/DSD warnings and clear aspects as well as under the line speed. It’s almost as if the TPWS has been placed/implemented in the wrong place and caused the train to apply its brakes automatically. Can you put down the service numbers you're experiencing this on? I can give them a try over the weekend. Just before you reach 60mph it throws the brakes on and the train comes to a halt. The fault board shows the WSP, Park Brake & general fault as being on although I can’t remember if that always was the case. After about 2/3 mins the brakes release & you can continue. Back up to about 50mph and it happens again. I’ve recorded a video of it happening but I refuse to sign up for a Google account to use YouTube. If anyone can recommend a good place to upload it I’ll do so. All exactly the same thing. Videos of all 3. Congratulations DTG...you’ve comprehensively knackered the 166 service mode. Clearly, as is traditional, absolutely ZERO quality control. ps In addition, FWIW I’d say the FPS on GWE is actually slightly worse than it was before the update (it’s certainly no better or smoother), and I’m still getting the pausing and stuttering associated with brief but significant frame rate drops. Both things that were meant to have been improved. Thanks everyone for the feedback, please keep it coming. I'm in the process of logging down the new issues posted in this thread so we can get them booked in with the Development Team. I realise my ranting (bourne out of sheer frustration) isn’t particularly helpful or constructive. I’ll just say one last time that I hope you can see how infuriating it is for DTG to release either a patch or DLC and almost immediately game breaking bugs become apparent by just simply playing the game. This is normally followed by Jay, now you, noting down the bugs to be ‘passed back to the team’. To put it simply, something HAS to change...DTG can’t go on like this, for your sake and ours. I’ll do my best to leave the moaning at that. Are these videos of this emergency brake issue any use to you? I do totally understand hightower, and I'll certainly relay your sentiments and feelings, and those of many others where it needs to be heard. The videos would be really useful, if you could share the links with me please, thank you. I don’t have a YouTube account, would Dropbox work for you? They’re just recorded using Radeon Relive and downscaled from QuadHD to 1080p but they’ll show you the issue well enough. ps Thus far the signalling & ATC/ACSES on NEC is a vast improvement, although the cab signal aspect is only showing Clear. I don’t fully understand US signalling if I’m honest but I’m not sure that is right. Still, it is now useable at least. Dropbox would be perfect, thanks hightower. Thanks also for the additional thoughts on the NEC route, I'll add the note on the cab signal aspect to my log. Just uploading them now, I’ll reply again with the link once they’re up so you get the notification. On the 2P50 video if you watch it right through you’ll see the brakes eventually release, then it happening again less than a minute later. It also shows the weird lighting bug that you get going in and out of Reading station, where the cab goes pitch dark for no reason. Thanks Hightower, confirmed safely downloaded at this end. Thank you so much for all the time you've taken getting these together, they will be immensely useful to us. FWIW, I ran an HST service from Reading - Paddington and that was fine, no random stops. You do not try your games? Just to help out those trying to fault find what the issue light be, I have followed the steps hightower did for cab setup in his video of 2P50 and replicate the fault exactly. If I enable the AWS fuse and TPWS fucntions, but leave the DSD isolated, then I do not get the fault with the brake application. I wonder if it’s a sound bug then, the DSD is going off but we can’t hear it so it throws the brakes on. It would make sense. Yes, something seems to be wrong with DSD. I get the emergency braking thing only when DSD is enabled. With just AWS on or all safety systems off, everything seems to be OK. It might be that DSD alarm actually works but it isn't properly passed to the UI. So the player can't hear or see it (the yellow sign in the HUD doesn't light up too) and therefore turn it off in time, which causes the emergency brake to be applied. I think it might be, I just reran under identical circumstances, but I was very rapidly pressing Q around the time the problem seems to occur and I was able to cruise on up to 70mph. So if anyone from DTG is reading, perhaps we are losing audio from the DSD/Vigilance for some reason and this is the cause of the issue. So, I ran service 2P50 twice between Reading and Twyford; the first time with DSD activated and the second with it deactivated. With it activated I got maybe a third of the way to Twyford before the brakes suddenly went into full application. Although I could move the throttle handle I wasn't able to release the brakes. The reverser handle refused to move. I also noticed the Brake Demand light on the TPWS panel had lit up. With DSD activated I was able to get to Twyford without any issues. DSD definitely appears to be the culprit. I wouldn't have caught that myself as I usually don't turn it on. Yep, It’s definitely a bug with DSD itself or the audio for it. I’m doing that service right now with AWS and TPWSIS normal and DSD isolated and It works fine. On the downside, the train body shimmer when stationary is terrible, as it is in NEC. > We've not finished with Diesel-Electric! Also, ATC still doesn't seem to work for me. I do manage to apply brakes, see the Suppression light on, but it still applies emergency brake because it just feels like it. I appreciate the improved FPS and stuff, but this ATC thing make it really hard to enjoy. Maybe I'm doing something wrong? As for GWE bugs, I haven't tested in the new version yet, but there was some TPWS bug with HST right at the Reading platform where it applies brakes regardless of your speed or something. It's not DSD or AWS, as spamming "ack" button really doesn nothing. Can confirm the DSD issue on the class 166 as well. Played 2N40 - 13:27 out of Paddington, the timing of it which was a brake application, I felt should have been a DSD alarm. Turned ‘Safety Systems’ to off and had no issues, so clear that it’s definitely a DSD issue. How come nobody is talking about the performance improvements? I have a lot more Fps now with the new patch, around 15-20 more. 60+ Fps on Ultra feels sooo goood and the game looks absolutely great, thanks for the patch. Fps still drop when a train passes by and the mission "Down The Line" in GWE still kills my fps at the beginning until some trains leave the station but else it feels really good. To be honest, I’m not seeing any FPS improvement at all. NEC is better than GWE, HH is still the worst by far & haven’t tried RT yet. What resolution are you using? I’ve tried upping mine from QuadHD (which was giving 35-45fps on ultra) to 3200x1800 and although the FPS counter is showing 10-15 less the game is much much smoother, and looks even better. Go figure. In the higher resolution the train body shimmer when stationary pretty much goes away too. The not so good though is that I’m playing an HST service and have just loaded from a save. The brake line bug is there and as someone else also pointed out, the wheels on the HST power car don’t rotate. When I restart the scenario from fresh it all works fine which would suggest the save game feature is sadly still broken. Sadly in my experience as far as GWE is concerned, this update has broken way more than it’s fixed. Im playing on 1920 (ultra) and the issue my system always had with TSW is the cpu usage. My cpu usage was and still is pretty low while playing Tsw and yet the game didnt run on straight 60Fps. 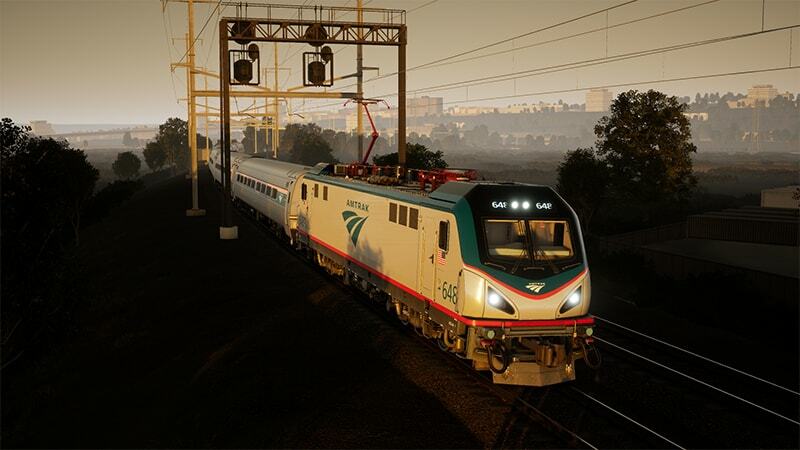 The patch notes said: "Improvements to physics on multi-core CPUs for performance improvements"
I just ran TSW for the first time since this update downloaded, selected NEC, and looked at both a freight and a passenger session. The FPS counter showed rates much better than those I remember experiencing before in both cases. The number now hovers around 71, which is very much appreciated. I'll take a look at other routes as soon as possible (spring has arrived and I've returned to lawn & garden duties), but I expect the same kind of improvement there. 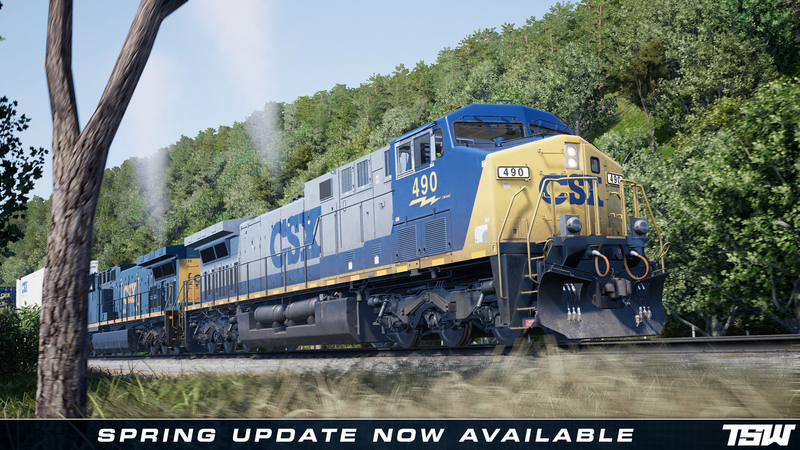 Slight edit: while running CSX route yesterday, especially the excellent switching scenario that comes with the CSX GP40-2 add-on, I found that performance looks about the same: as I've reported before, FPS rates are rather "low", but that seldom affects the overall experience. I'm quite sure that they do, but the point here is that they are asking forum members to provide comments about the latest update. Good grief! Known issue since 2,5 years and still not fixed! And the brakes of the AC4400 are still buggy, FIX THAT! In the update, they said that we are not finished with Diesel-Electrics, stay tuned in this month. 1,5 gb update, mostly for NEC. Why do I need to download everything, even if I don't own every DLC? This is killing my monthly data transfer. Could it be done in future, that there are separate patches for main game and separate for DLCs?